Melt the almond bark carefully in the microwave, or in a double boiler. Assemble the cups by dipping half of a Cheerios™ in the melted almond bark, and then sticking it to a phyllo cup. Let it dry. Meanwhile, whisk together the yogurt and cocoa powder until combined. Spoon about 1 tbsp of the yogurt mixture into each phyllo cup. Then top with a small dallop of whipped cream, and dust with extra cocoa powder. Place cup on a cookie as its saucer. Feel free to use extra melted almond bark to glue the cup to the cookie if desired. These tiny yogurt dessert cups will be the hit of the party! For all of you tea and coffee lovers out there (or chai, hot chocolate, steamers, lattes, or whatever your drink of choice may be! ), I have a super cute dessert idea for you! Introducing … Coffee Cup Yogurt Cookies! 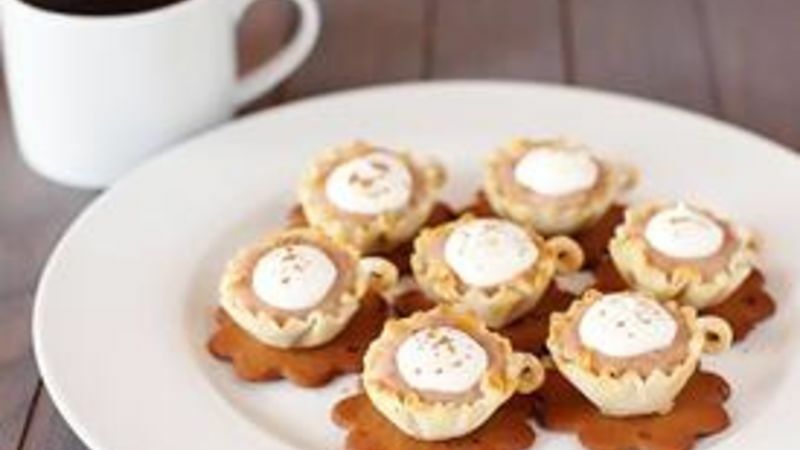 When you top the yogurt filling with a little whipped cream, and place them on their super-cute little “saucers”….the adorable factor goes right through the roof! The fun thing is that these are totally customizable too. Feel free to fill with your favorite flavor of yogurt or top with your favorite drink toppings. Either way, they are totally easy, delicious, and a fun way to enjoy your cup o’ Joe. Err…yogurt. That’s not butter! Begin by melting some white almond bark to form the glue for your cup handle. Then use that tasty glue to gently press a Cheerio into the side of a phyllo shells. (If it starts to fall down, just set the cup on its side up against a bowl for a minute until it cools and hardens.) Repeat with the whole batch of shells. Then mix up your second bowl of goodness – some Yoplait Boston Cream Pie yogurt and cocoa! The yogurt will turn nice and chocolate-y and look like a creamy latee! Way too cute! Almost too cute to eat. But you must dive in – they are delicious! !